Tell the Patriots to tackle hate and skip the White House! Several Patriots members boycotted the white house visit! We can not normalize hate! Over the course of his campaign and brief time in office, Donald Trump has shown that he is unfit for office and dead-set on waging a war on people of color and immigrant communities. That is why we are asking members of the New England Patriots to join four of their fellow teammates- Chris Long, Martellus Bennett, Devin McCourty and Dont'a Hightower- in standing up to hate and refusing to go to the White House. There is nothing that Donald Trump hates more than negative publicity and perceived slights. This is a powerful opportunity to publicly shame Trump and prevent the normalization of hate. We need everyone- especially folks in power and in the public spotlight- to stand in solidarity with the millions of people standing up to Trump's hate-filled agenda. The Huffington Post reported that out of the 68 members of the Patriots, less than half showed up to the White House for a photo op event with 45! "Defensive tackle Alan Branch said he would skip the ceremony because of Trump’s sexist remarks, and “wouldn’t want to spend time away from my family to shake the hand of a guy I wouldn’t want to meet with or talk to." 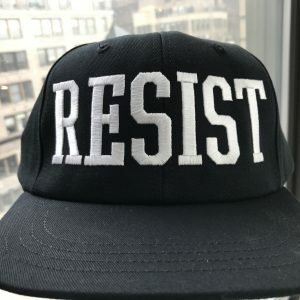 Mijente has created an online where you can now buy awesome hats and hoodies- including some of the anti-trump hats you may have seen over the last year! Visit store.mijente.net to get yours!